A weekend surcharge applies for travel on Fridays, Saturdays and Sundays. A high season surcharge of approx. R1400.00 per person may be applicable and will be included when requesting a quote from The Holiday Factory. Please contact The Holiday Factory for packages from Durban and Cape Town. 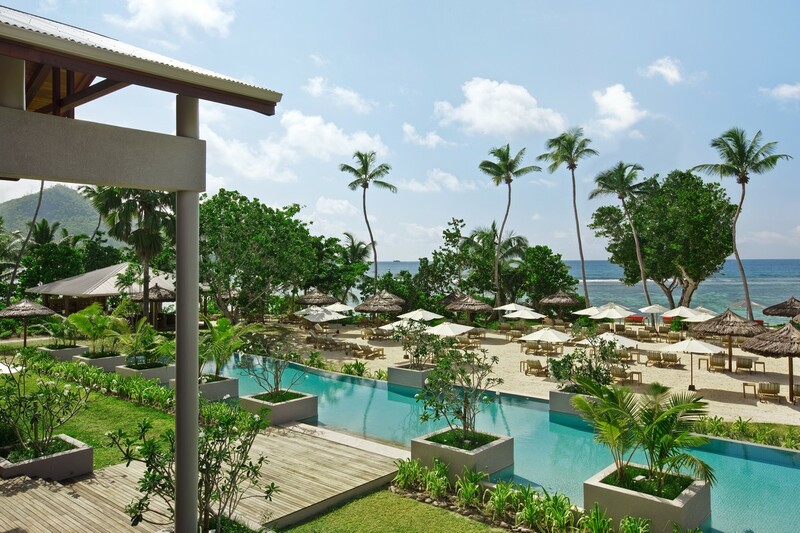 Luxurious and intimate, this is a modern 5 Star property on Mahe - upmarket, peaceful and relaxing with an amazing tidal beach beach protected by a reef around 200 meters out. Set on the South West Coast this indulgent retreat is family friendly with a giant tortoise enclosure, a great kids club, and children are very special guests with their own in-room amenities. There are good accommodation options with 5 different room and suite categories and all rooms are lovely and spacious with a separate sitting area. 148 rooms are available in the following categories. All rooms have a bedroom level and a sitting area situated three steps lower, allowing for unencumbered views from the bed. Guest can upgrade to a Half Board meal plan. The open air all-day-dining restaurant offers healthy breakfasts, themed buffet dinners and everything in between - and even if you're not hungry, it's a great place to drop in for a quick coffee. 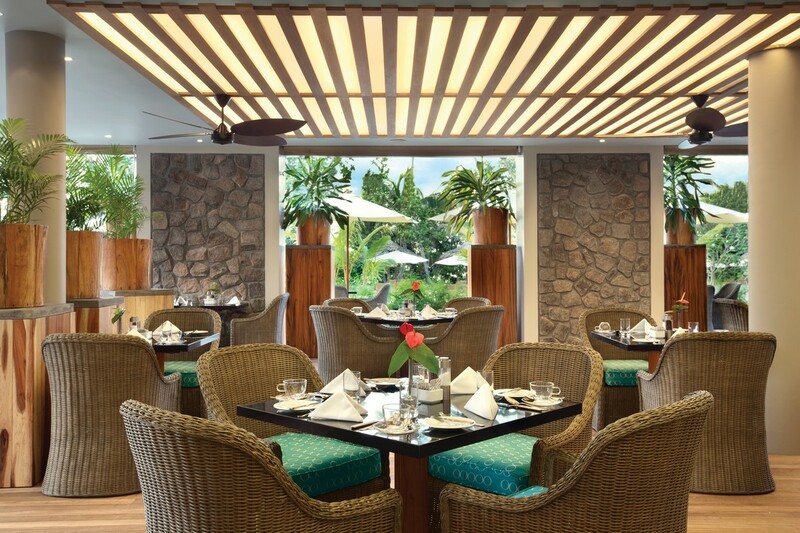 An air-conditioned specialty restaurant featuring a fusion of cuisines from the rim of the Indian Ocean, with an accent on seafood. It is open for dinner only and can seat 50 guests including 8 guests in the Private Dining Room which also contains the Cave de Jour/ Wine display. A beautiful beach location for a beachside lunch or al fresco dinner. One of the most popular signature dishes here is the Hot Stone Steak or Fish option –prepare your own meal on a hot lava stone at your table. Located on the lobby level and is open air. It offers exotic cocktails, tapas and suchi besides all the favorite drinks and is also the ideal place to enjoy an aperitif or a nightcap while relaxing to live music. Kempinski the Spa is a journey inspired by the European cycle of the seasons. The 6 treatment rooms, include a couple’s suite. 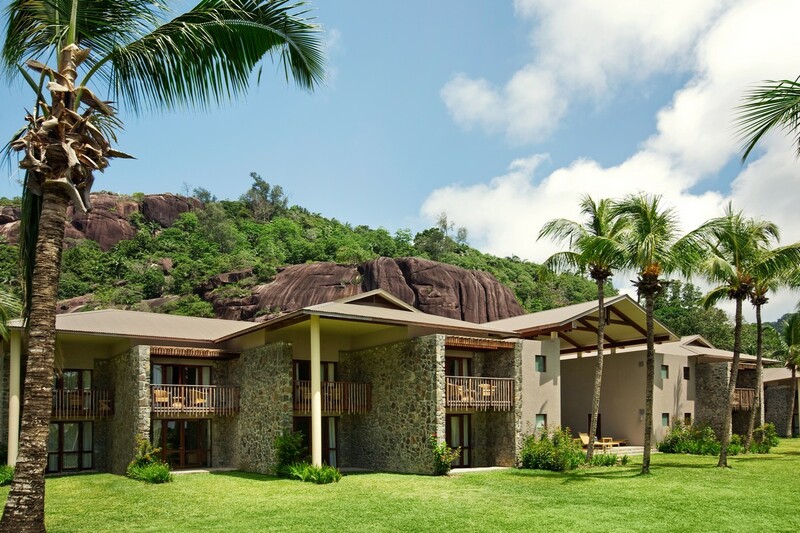 The Spa has its own tropical relaxation garden which is dominated by a typical dramatic rock formation unique to the Seychelles. One hundred and fifteen coral and granite islands rising up out of the Indian Ocean – this is the Seychelles! 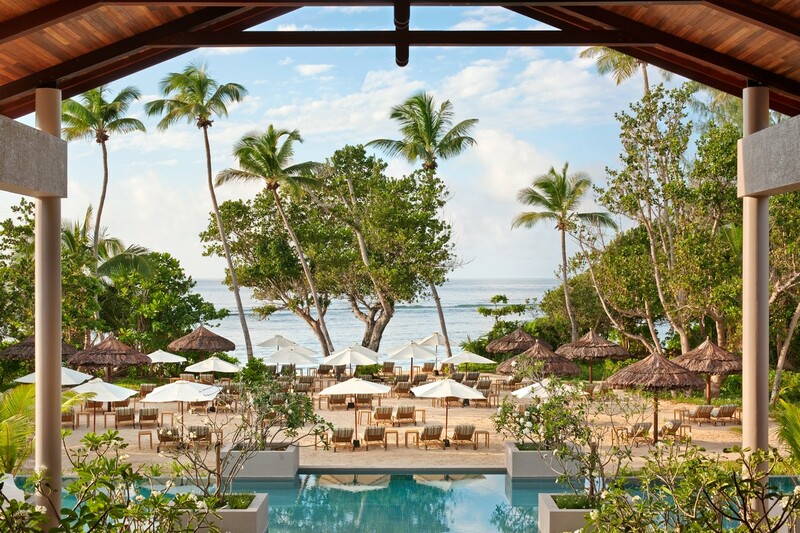 A dream come true - calm azure waters, deserted beaches, tropical paradise and turquoise lagoons. This string of islands offers sparkling white sandy beaches and coral reefs bustling with sea life. The flora and fauna are unique, the mountains are covered in lush vegetation, and the landscape offers a stunning and multi-faceted panorama. The first European to pass through the Seychelles was Portuguese Admiral Vasco da Gama in 1502, followed by the English in 1609. A transit point for trade between Africa and Asia, the islands were used by pirates until 1756, when the French took control, laying down their "Stone of Possession" (visible today at the museum in Mahé) and naming the islands after Jean Moreau de Séchelles. Britain and France fought over the islands from the late 18th to early 19th century, with Britain finally gaining control in 1814. Achieving independence from Britain in 1976, the Seychelles today is a true success story of people who claim origins from all over the world and live together with an unusual and inspiring degree of harmony in diversity. Seychelles’ 115 islands fall under two distinct groups; the outstandingly beautiful granitic islands, the world’s only oceanic islands of granitic rock and coral islands fringed by white sandy beaches and encircled by coral reefs teaming with fish. The three most popular islands in the Seychelles archipelago are Mahé, Praslin, and La Digue. Home to 98% of the Seychelles' population, these three are clustered in the archipelago’s northeast area known as the Inner Island group. Mahé and Praslin are Seychelles' largest islands (nearby Silhouette Island is larger than La Digue, but less populated), and all three are granitic (versus coral). The Inner Islands also include other popular islands to visit, such as Denis, Bird, Silhouette, and North. Seychelles’ enviable climate is always warm and without extremes. In this tropical haven, the temperature seldom drops below 24°C or rises above 32°C making Seychelles a year round destination for sun worshippers and beach lovers. During the north-west trade winds that occur between the October and March, the sea is generally calm and the weather warm and humid, in January and February the islands receive their life-giving rains, rejuvenating the rivers and streams. From May to September the weather is cooler and drier with livelier seas - particularly on the south-eastern coasts. The Seychelles is 2 hours ahead of South Africa. For visitors who can tear themselves away from their resort, the Seychelles offers a wide variety of things to see and do; from the prehistoric rainforest of Praslin’s National Park to the 70 beaches of Mahé and endless water sports. You could take an excursion to Mahe’s capital, Victoria, to admire its colonial mansions and meet the giant tortoises at the botanical gardens. You can also visit tiny islands such as beautiful La Digue, perhaps joining local fishermen in their boat for a day’s angling in the abundant waters. You will find proud national monuments, beautiful Creole houses, artists' studios, national reserves and marine parks, as well as breath-taking natural wonders above and beneath the waves. There are guided nature tours to enjoy some of the rarest species of flora and fauna on earth. 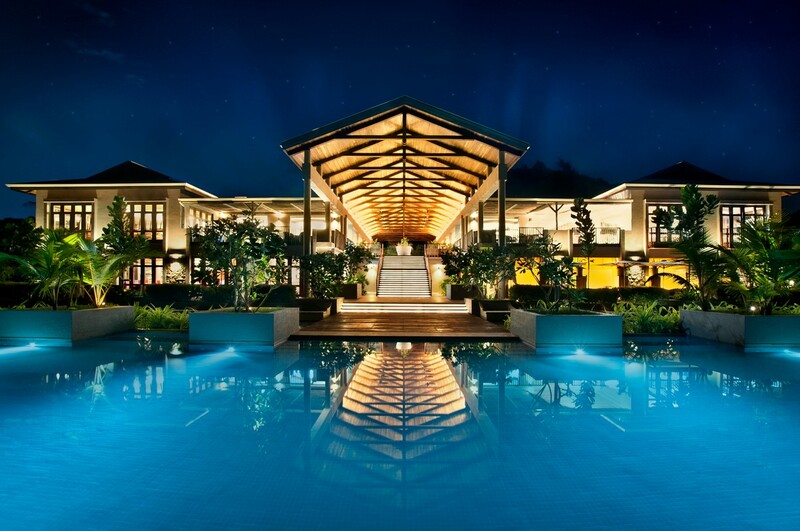 Not forgetting the mellow Seychelles nightlife where you can take in a casino, some local bars and fine restaurants offering unforgettable Creole and international cuisine. The first port of call for most visitors to the Seychelles is Mahe. This is the largest island of the Seychelles and the largest granitic island – 27 km long and 8 km wide. Forming the backbone of the island is a spectacular mountain range that includes Morne Seychellois, the island’s highest peak. Around the peak is one of the island’s beautiful national parks, offering good hiking and stunning scenery. More than 60 idyllic beaches fringed with swaying palm trees can be found along the shoreline, offering a host of activities including diving and fishing. There are several interesting sights to see, particularly in friendly Victoria. Praslin is the second largest island of the Seychelles, 44 km north east of Mahe and can be reached by plane or ferry. This island is a popular tourist destination with several hotels and resorts, as well as the famous beaches of Anse Lazio and Anse Georgette. The beautiful Vallee de Mai is known for the unique Coco de Mer. La Digue is a small island accessible by ferry from Praslin. Here cars are shunned in favour of bicycles and ox-carts. A timeless oasis, hidden away in the vast expanse of the Indian Ocean, La Digue is the Seychelles of yesteryear. Home to some of the most beautiful beaches, La Digue also boasts the friendliest people and most tranquil, serene and relaxed atmosphere. Seychellois - the common name used for the population of Seychelles - speak both English and Creole. Throughout Seychelles the voltage is 220-240 volts AC 50 Hz. Seychelles uses the British standard square three-pin, 13 amp sharp electric plug. International visitors are advised to bring their own adaptors. Seychelles offers diverse and impressive diving opportunities. The Inner Islands rest on a shallow plateau with prolific marine life and excellent PADI diving facilities are available with access to a multitude of dive sites. The Outer Islands to the south of the archipelago are all coralline or sand cays and mainly uninhabited, presenting the experienced diver with excellent opportunities to explore where few have gone before. If you are a certified diver, travel with proof of certification and discover this miracle of nature. As the Seychelles are warm throughout the year it is recommended that you pack light comfortable relaxed clothing. Most resorts are quite casual, so light clothing should be adequate at most times - you may also want to take a thin rain jacket in the event of the occasional rain shower. Don’t forget your beach wear plus sun screen and sun glasses.